Floyd Mayweather Jr. wins… ok nobody is surprised. The outcome of Saturday's fight was never in doubt, not even when the fight was first announced back in February. The media tried to spin it several different ways to make it seem as if Guerrero had a legitimate shot: Floyd hasn’t fought in a year, he spent two months in jail, his father is training him for the fight and, with their past troubles, it’s going to be a huge distraction in the Mayweather camp. Please, that fight might have been competitive if Floyd Mayweather Sr. taken on Guerrero, although I still would have predicted him to win 115-113 on my scorecard. 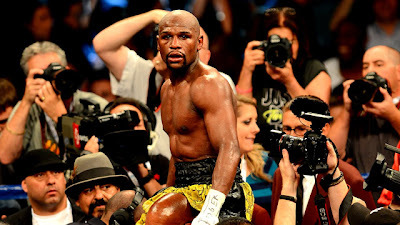 Now that that’s out of the way, it will be interesting to see if Floyd Mayweather truly wants to go down as a legend in the sport, or if he wants to continue to hand pick opponents he knows he can beat, collect an easy paycheck, and never truly put his perfect record on the line. With Manny Pacquiao’s star power waning, Floyd has become the undisputed king of the throne and the face of the sport and with his Showtime mega-deal. With the network committed to doing everything it can to promote Floyd, he has a real opportunity to bring boxing to new heights and put some life back in the sport. The only way Floyd can do this, though, is by fighting legitimate opponents who can actually pose a threat to him. I understand Floyd taking on Guerrero; he was the WBC interim welterweight champion, #1 contender to Floyd and had been calling him out for months. So no beef there, it was a nice easy win and welcome back fight for Floyd, but now it’s time to get serious. There are several high profile fighters out there for Floyd to choose from including Saul “Canelo” Alvarez, who is coming off the biggest win of his career against Austin Trout. It would be a perfect fight for September on Mexican Independence weekend and the perfect counterpunch to HBO/Top Rank’s show that they are going to be putting on that weekend with the a Timothy Bradley vs. Juan Manuel Marquez (the two fighters who beat Manny Pacquiao back to back) main event. It would be an unbelievable weekend for boxing. Floyd doesn’t have to fight Alvarez though, there are several other names on that list including Lamont Peterson, Adrien Broner, Danny Garcia and Sergio Martinez, just to name a few. All these fighters are real threats to Floyd and would be career defining wins for him. The decision is Floyd’s, however. Does he want to go down as one of the sports' pound-for-pound kings, or as one of boxing's biggest cowards? Does he really want to be more known for who he didn’t fight than who he did?